A nice little exercise. – Dirty wet dog , boats and sailing. You guys are all probably wondering about the ‘rescue’ that i have mentioned in relation to my time in Chichester. It’s not that i’ve been all coy about it, i really did need an assist, it’s just that i haven’t had the pictures to really illustrate what actually happened. What i will do here is explain how it came about and what actually happened but i would also like to have the post as one of those neat little yachtmaster exercises where the examiner sets a scenario style problem for the students to solve. If you will then please have a go at working out some possible solutions : i thought of a few myself but couldn’t use most of them as you will see. The passage from Newhaven to Chichester bar was the first really nice day of the trip once the wind dropped and stabilised a bit. The morning that i left Newhaven it was blowing strongly from the north and therefore straight down the harbour. I had hoped to sweep down the entrance in fine style but i just didn’t have the space to get the sails up and turn so i just ran down under stays’l. I did get the main up in the outer harbour but had to drop all the reefs in straight away just outside as i could barely steer. It was gusty and unstable for a while and then calmed down a lot. For a while i was easy-reaching with a strong ebb flow pulling me along the coast. For a bit of navigational fun i took the inshore ‘looe’ channel off Selsey and by late afternoon was motoring into Chichester harbour over the bar. This trip was only the second time i have been into Chichester and what i wanted to do was anchor as soon as i could, have a break and then think about where to go and lay-up for the night. Pete had told me about an anchoring spot not far from the entrance and looking at the chart i could see a neat little bay just around from the North Winner buoy and near to a racing mark. To one side was the main channel but i would be out of the channel, one side is essentially beach and 2 others formed by the ‘winner’ sand and shingle bank. At low water i had something like 9 or 10 feet under the keel and enough space to go to a 5:1 rode at high water. The spot looked ideal as it was out of the channel and seemingly protected all round by banks and shallow water. The wind had dropped right away too so this is the view from the boat as the light changed and folks out enjoying the late afternoon sun. As the sun set i had a re-think about the anchorage as my instincts were then suggesting that i should move just across the channel into a different area slightly upwind in the light breeze or move up into the main Emsworth channel on the flooding tide. Instead i set my rode for the night, took my reference bearings and made dinner. The first hint of a potential problem came during the ebb tide much later during the night. The ebb was hissing past the boat and obviously flowing fast over the winner sand not far behind me but the anchor was clearly in hard and i hadn’t moved. There was still hardly any wind and i figured that even with the anchor in deep i would get off in the morning by shortening the rode and letting the rising tide lift and rotate the anchor out. In the morning though the first of several problems came when the engine wouldn’t start….then the tide kicked-in from directly astern and the wind picked up from directly ahead… so then a classic wind against tide situation developed. Inanda then swung to the new flood which was sluicing past the boat but that put the increasing wind directly astern such that i couldn’t get the mains’l up. Without the stays’l halyard i couldn’t get my second-option sail up either but both were moot because i just couldn’t budge the anchor anyway. I don’t think i have ever not been able to shift so small an anchor but believe me it was in hard. Chop just started to build, after this i was too busy. So, first problem : the engine won’t start. I did the obvious basics first, with the battery switch on i checked what happened when i pressed the starter button, the result was a click from the solenoid but no action from the starter motor. My suspicion then had to be a flat battery first. The engine has always started first time for me except for one time when i hadn’t fully closed the stop-pull. So : Electrics. Inanda has hardly any electrical system to speak of, just the engine charging a single small battery which is also the cranking battery. Aside from that there is only a hardwired log/depthsounder which is always on when the main switch is on. After that there is an automatic bilge pump which is wired direct to the battery and that i hadn’t heard running in the bilge. 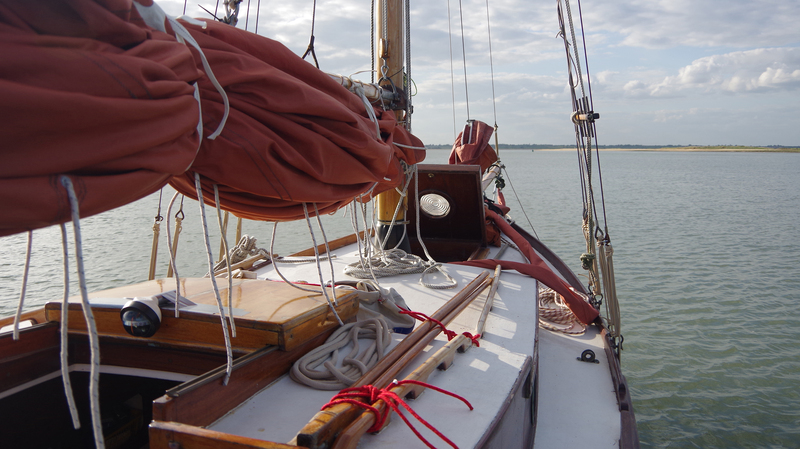 Once i had checked the anchor and our position….and had a brew, i had a rethink and re-check. The only thing i thought could have happened is that the poor electrical connection to the bilge pump might have been in the bilge-water and thus discharged the battery slowly. The only other electrical connection to check is a second poor connection near the solenoid which Pete had warned me about and needs a redo when i have my electrical kit on board. I remade that connection anyway but with the same result. Outside the situation was deteriorating a bit, the wind was picking up a bit and the tide was certainly flowing faster. There was a brief window when i was laying head to wind but after that i was laying to the tide with the wind firmly from aft. That meant that i was unable to hoist the mains’l at all and i knew i couldn’t hoist the stays’l because i had lost the halyard. Possibly with the stays’l up i might have been able to sail just enough on the strong flood to get out of the little bay that i was in but it would have needed very quick work on the anchor and some luck with the sailing. With a dinghy i would have rowed my big kedge on it’s nylon warp up to windward and kedged her back into the channel, re-anchored and kedged again if necasary. This is when the second problem came to light. First try… I thought that what would be worth a try would be to pop the anchor and see if i could just drift in the strong flood back upwind, i’m pretty sure that Inanda would have then laid across the tide and maybe started to ‘sail’ with her topsides but i might still have gone clear and if not i would have immediately dropped the anchor again. The second problem was that the anchor was in so hard that once shortened-up i couldn’t budge it any further although i have to add that there was very high tidal flow around the boat. I think i could have kept the anchor short and let the rising tide help me lift the anchor but i would then have had the immediate problem of what to do next. As it is this is the point where i started phoning around to see if i could get a tow. While we are here lets set the yachtmaster exercise which i was failing at. My actual position was essentially next to the racing mark next to where the map reads ‘dunes’ in the obvious small bay/cut there. The wind was about F5 from the north and the tide was flooding strongly across the winner sand immediately to my south. As you can gauge from the map i didn’t have much sea-room either downwind or to either side. In better conditions i should have been able to get the anchor up and sail out of there but my situation was that i couldn’t get my mains’l up because i was pointing dead downwind and i think i would have struggled with the stays’l to get her to come up into the wind unless i got some reaching speed up first and i don’t think i would have had the sea-room to do that. Your exercise then is to have a think about what you might do in that situation or what i could have/should have done. Have fun…or at least more fun than i was having on the day. I thought that i would add a section : what i think my mistakes and options were. Not moving the night before when my instincts were telling me to. Not sorting the stays’l halyard out before. Only having the one anchor set up and ready to use. Not setting the Manson up with the shackle in the sliding slot that allows the shackle to be run forward if the anchor is fouled. Not setting up a heaving tackle to try and shift the hook…..the gear was available. Previous We need to talk about Martin. No searoom, wind-and-tide against you, a dead engine and a u/s stays’l halyard — as you say Steve, no fun. If not in a hurry, I’d have made a cup of tea (or three) and hung around for better wind and tide conditions to then try and weigh anchor and sail out under the main. In the meantime, I would probably take a longer look at the engine and electrics in case I’d missed something in the more urgent circumstances earlier. However, If I needed to be somewhere or felt like the anchor wasn’t going to hold, I’d call for a tow. Tricky one. Rowed ashore and watch events unfurl from the pub? No? With the anchor popped out, it may have been somewhat unpredictable what happened next in terms of how she lay and whether that might enable you to hoist something to get you out of there. You still had no power and no tools to do any electric fiddling to try and get engine to work so at some stage you would have to get that sorted ashore. Evening time approaching, no powere, no nav lights, busy harbour, under sail… not a pleasant thought. If the anchor was bedded in enough to hold you in that situation and the wind wasn’t getting worse, tide easing, a friendly call to the harbour master might have sent a launch in your direction.